Needless to say, this service isn’t going to go out of fashion anytime soon. At Pedi Source, we’ve seen several clients increase their revenue and customer base by investing in the right type of chairs. Here we have a few chairs with excellent pedicure designs, which fall under $3,000. The Daisy 3 pedicure chair is manufactured by Gulfstream, a very well-known brand in this industry. It’s newly designed and comes packed full of interesting and useful features that would help your technicians do a better job and ensure your customers have a good time. This chair is highly-customizable and you can choose from different colors, bowl options, vented exhausted options, base color, discharge pump, and backflow options. It costs only about $1,995 and will serve you well for many years to come. You’ll earn back your investment quickly so you should consider buying it. This is another chair from Gulstream and has a very eye catching pedicure design. The upholstery is made from quilted leather and you get a number of color, exhaust, base color, embroidery, backflow, and discharge pump options. The chair has efficient massage technology in it that will ensure your clients have a good time. The price tag on this chair is only $1,995 though it originally costs $2,500. Again, this is a great investment to make because the chair would function well and look great for several years to come. This pedicure chair is manufactured by Pibbs and its original price tag is $3,295. The chair looks and feels expensive but we sell it at a discounted price of $1,999. You can choose black, burgundy, or spa beige colors for the seat to complement the gunmetal pearl base. The chair comes with manual slide and recline function and has 6-mode vibration massage functions that would help your clients relax even more, during the pedicure. The best feature of this chair is the design because everything from the rich leather upholstery to the pearl base makes the chair look luxurious and comfortable. This chair is manufactured by J&A, which is one of the best pedicure chair manufactures in the industry today. The chair looks elegant and sophisticated and comes with three different chair and base colors. The base is made from hand-crafted fiberglass and the upholstery is made from leather. It also has adjustable vibration massage systems that work well to relax clients. This chair would set you back $2,495 but it’s worth every penny you spend on it. It’ll offer your clients a luxurious experience that they’ll keep coming back again for. This is another Gulfstream product and you can expect that same reliable Gulfstream quality from it. It’s highly customizable and you can choose from 7 chair colors, 9 bowl colors, and 4 base colors. You can also add custom embroidery on the chair so that it has your brand name on it. The bowl is made from artistic glass, which adds to its overall appeal. You’ll get this pedicure chair for sale and will only have to pay $2,495. That’s a significant discount because the chair originally costs $3,150. This pedicure chair is manufactured by AlfaAlfa and is designed and assembled in the USA. It’s made from fiberglass and is very elegant with its timeless pedicure design and luxurious leather upholstery. The chair originally costs $3,000 but we offer a significant discount of $500 so you can purchase it for $2,500. The well-designed and comfortable chair will draw your clients’ attention and encourage them to book another appointment. 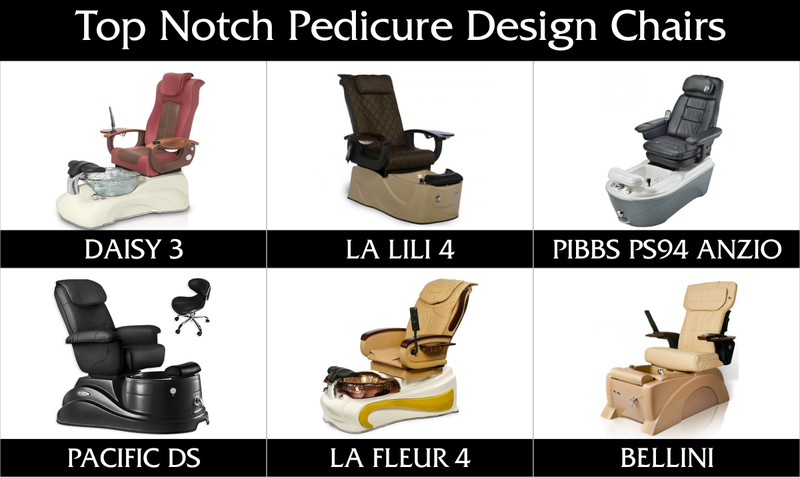 If you have any questions about pedicure chairs for sale, you’re free to contact us at Pedi Source. Just give us a call at 1855 429 PEDI. You can also email one of these two email address with your questions and contact details: [email protected] and [email protected].